Texas oilman T. Boone Pickens asked Congress on Tuesday to "clear the path" for his plan to boost use of wind and natural gas for U.S. energy needs. Pickens has been on a $58 million publicity tour to promote his plan to erect wind turbines in the Midwest to generate electricity, replacing the 22 percent of U.S. power produced from natural gas. The freed up natural gas then could be used for transportation. Testifying before the Senate Homeland Security and Government Affairs Committee, Pickens said the government should begin building transmission lines for wind-generated power or provide the right of way on private land and extend tax credits so the private sector can build the lines. "If the government wanted to build a grid, I mean, do it," he said. "But if they don't want to do it, I think the money is there to do it private, and so it's kind of like either do it or get out of the way, but give us the corridors to put it in and it'll be done. You could do this on a very, very fast track if you wanted." Pickens suggested that Congress follow the lead of former President Eisenhower, who declared an emergency to build the interstate highway system in the 1950s and 1960s. He warned that oil could cost $300 a barrel in 10 years as supplies drop, if the nation continues to "drift" on energy policy. Pickens has leased hundreds of thousands of acres for a giant wind farm in West Texas, where he plans to erect 2,700 turbines and produce energy for urban areas such as Dallas and Fort Worth. He has run into some opposition from West Texas landowners who are unhappy with his efforts to obtain rights of way to build the wind farm and a pipeline for a separate water project. Specifically, Pickens asked Congress to extend a 2005 law intended to speed up the creation of energy corridors, and to give him control over any transmission lines he builds for wind-generated power. All electric transmission lines are now regulated by the Federal Energy Regulatory Commission. 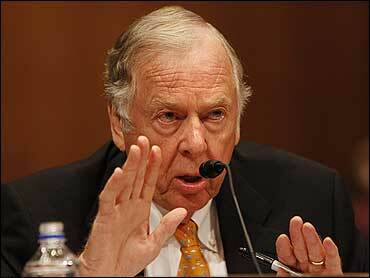 Pickens also called for a 10-year extension of a tax credit for energy producers. He estimated it would cost taxpayers $15 billion a year in production tax credits for 200,000 megawatts of wind power. "When you look at $700 billion dollars going out of country every year for purchase of oil, $15 billion is somewhat insignificant," he said. Sen. Joseph Lieberman, I-Conn., called Pickens' plan bold and said he hoped Pickens' testimony would "infect people in a position in Washington to do something about it." But the oilman's plan raised questions with Sen. George Voinovich, R-Ohio, who asked if it would hurt the chemical industry, which relies on natural gas as raw material. He said the industry probably won't like seeing natural gas costs increase. Pickens estimated it would cost about $500 billion to increase wind energy production from the 4,000 megawatts to be generated at his Texas wind farm to 200,000 megawatts, the amount needed to power 20 percent of U.S. energy needs. Transmission lines and the tax credit would add another $15 billion. At that level, he said, "You're approaching about one year's supply of oil that you're buying. But don't get the idea that replaces that oil, it doesn't. It will only replace 38 percent." In addition to the hearing, Pickens also met privately Tuesday with Democratic and Republican members of Congress as well as Texas senators.